One day at JoAnn’s a piece of animal print sweater knit jumped right into my hands. Really. It was a bit over 1 yard and of course enough for a top. I don’t normally wear animal prints but I guess I was feeling a little wild that day. My aim was to make something I could wear over my favorite fleece leggings. Something that would cover my rear end, ya know? So I picked McCalls 6612, because I happened to have a copy and even though it said I needed 1 5/8 yds, when I laid it out I could actually fit the pattern on my little yard of fabric (but I did shorten the sleeves and length a bit). Close-fitting, pullover dresses have neckline/sleeve variations and narrow hem. Mostly. I had trouble with the back neck area, but that’s probably just me. Otherwise it was pretty simple. This was the first drape neck type top I made, and while the drape neck is ok, I later made one from another pattern that I like much more. I also took off the rouching on the sides, it seemed like it added too much bulk, maybe because of my sweater knit. The pattern ran large, I was swimming in it until I took it apart and cut it down a couple sizes in the shoulder/bust area. Shortened length and sleeves, narrowed shoulder (a lot), removed side rouching. I would never do it again in a sweater knit, but possibly in a lighter knit fabric. 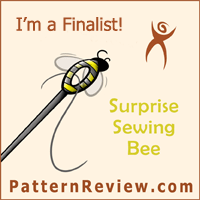 This entry was posted on Tuesday, February 25th, 2014 at 8:46 pm	and is filed under Sewing. You can follow any comments to this entry through the RSS 2.0 feed. You can leave a comment, or trackback from your own site. Oh this is sharp! I love the print with this pattern- nice flow.